Clark Ashton Smith was born and lived the entirety of his life on the west coast of the United States. In the foothills of the Sierra Nevada range Smith never ventured far from Auburn, California. Residing near San Fransisco, Smith found himself in a circle of poets that would be the center of the west coast’s literary scene for generations to come. Born in 1893, Smith was a contemporary of H.P. Lovecraft and a pupil of sorts to George Sterling. Sharing with Lovecraft an early discovery and love for The Arabian Nights as well as the works of Edgar Allan Poe, by the 1920s the two men would become close pen pals. Clark Ashton Smith dedicated much of his early life to poetry. His first collection of poems, Odes and Sonnets was an immediate hit on the west coast, and while it wasn’t particularly well known outside the region, it drew the highest praise from many of the foremost poets of the period living in the region. He was drawn into the “Bohemian Club”, a group of respectable writers, by George Sterling. But upon contracting Tuberculosis and with little financial stability, Smith would never allow himself to become a frequent member of this circle. Much like H.P. Lovecraft, Clark Ashton Smith would gain most of his broader popularity posthumously. As most of his works were only published in limited edition at local presses, the works of Smith would take many more years to fully spread his legacy around the western world. While, in particular, “The Hashish-Eater” found a broader audience and garnered wide-spread acclaim, by the time of Smith’s death in 1961 he was barely remembered and thus the even of his death went wholly unnoticed. From the drastically increased popularity of H.P. Lovecraft over the last thirty odd years, the name Clark Ashton Smith has arisen more and more often. Smith and Lovecraft both frequently contributed to Weird Tales throughout the 1920s – 1930s. The two writers were in communication often through this period, which is evident in the number of times that they borrowed from each other’s mythologies. 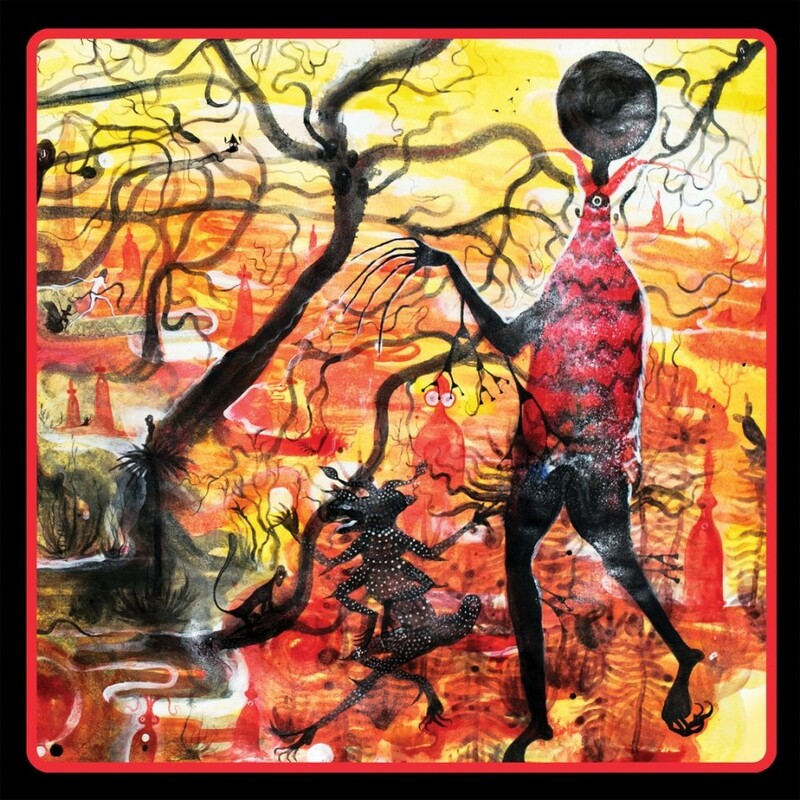 Cadabra Records have taken the weird fiction of H.P. Lovecraft very seriously and have already released two beautiful albums of spoken art. With Andrew Leman reading the stories and Theologian creating custom soundscapes to fill out the atmosphere, both these works are delightfully well executed. On The Muse of Hyperborea, Cadabra Records moves into a bit different territory, yet continues to pluck at similar emotional chords. 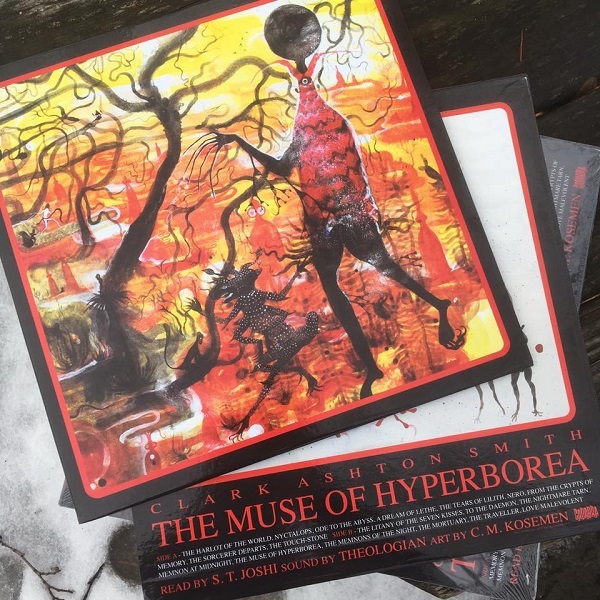 The Muse of Hyperborea is a collection of Clark Ashton Smith‘s poetry. Equally distributed between metered poetry and prose poetry listeners are given a thoroughly diverse image of Smith’s styles and execution. None other than S.T. Joshi, the man behind pretty much every leading treatise on H.P. Lovecraft, has this time recited the poetry of Clark Ashton Smith. His delivery is quite different from that of Andrew Leman, yet the eerie elements are quite pronounced. Joshi uses his deeper tone voice to his benefit and slowly delivers each poem in a way that best fits the format of each individual piece. The metered poems are delivered almost musically as he is easily able to translate the rhythm of the individual lines into the perfect aural space. The second poem on side A, “Nyctalops” is a perfect example of this almost musical delivery. In this way Joshi is able to fully immerse listeners in his readings. The other half of the poems curated for this release are in the prose-poetry format. In which the poems are crafted much like a short story, but still manage to retain the literary depths and beauty of his metered poetry. On these poems, Joshi often takes on a more eerie style than on the metered. His words are each delivered with a trained precision that brings the stories to life in a way many audio-book authors could only dream. This is quite understandable, as Joshi has dedicated a good deal of his time to a thorough understanding of the life and works of Clark Ashton Smith, as he was such an integral element in the life of H.P. Lovecraft, the subject of Joshi’s ultimate scholarly focus. The subject matter of the compiled poems is reasonably wide ranging. Yet, if there is a connecting theme running throughout, it is the dark and weird elements, which would later become part of Smith’s weird prose fiction that featured in the annals of the Weird Tales magazine. The following metered poem appears half way through Side A and is a brilliant example, in short, of Smith’s amalgamation of the romantic with weird and often occult themes. Some silver philter, sweet and dire. Side B delivers two fitting poems as opener and closer of this second half of the album. On “The Litany of the Seven Kisses”, a prose poem, Smith delivers a piece which is certainly the most romantic of these compiled works. As a stark contrast to the opener, “Love Malevolent” closes the album with the description of a love enshrouded in the macabre, invoking the imagery of graveyards and opiates, vipers and poisoned kisses. Theologian proves once again that his dark ambient talents are a perfect match for the Cadabra Records template. Knowing Theologian best from his harsher industrial elements and his previous project Navicon Torture Technologies, it would be a surprise to find that he is able to also craft such toned-down soundscapes. Yet, anyone who has followed Theologian closely over the years will likely have expected his talents to run into such wide-ranging areas. Running the Annihilvs Power Electronix label, the man behind Theologian knows how to work with a broad variety of styles and even genres. His ability to find diamonds-in-the-rough is quite well known to his more intimate followers. As Theologian explains in the liner notes, he had a totally different approach to The Muse of Hyperborea than he did on Pickman’s Model or The Lurking Fear. Especially with Pickman’s Model, the story was a direct narrative. It was literally delivered from the mouth of the protagonist to one of his fellow art enthusiasts. So Theologian had a need for creating a sort of soundscape to encompass the landscapes of the cafe in which the narration centers, or the cellar where one of the final scenes takes place. The Muse of Hyperborea, being a collection of totally separate and diverse poems, gave Theologian the freedom to focus wholly on atmosphere and emotion, and less on complementing a narrative. This often leads his sounds into eerie, other-worldly and down-right hypnotic territory. Some of the musical pieces will extend across several poems, slowly building and oscillating upon their foundations. Others will bring a specific mood to a given poem, taking its cues from the delivery of S.T. Joshi. The Muse of Hyperborea is yet another absolute delight from Cadabra Records. It is quite inspiring to witness the product of a deep-seated love for the Spoken Arts medium. 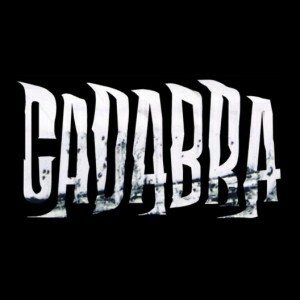 Cadabra Records cut no corners, leave no element of their product lacking. From the color variants of the vinyl itself, to the sturdy construction of the jacket, to the beautiful art of C.M. Kosemen commissioned specifically for this release, Cadabra Records give us another gem to add to our collections of their indispensable and steadily expanding catalog.